Need a great idea for a science project? How about making rock candy by growing sugar crystals. Growing sugar crystals is a fun and great idea for your next science project. Growing sugar crystal is very easy to do using ordinary granulated sugar and boiled water. If allowed to grow under ideal conditions sugar will form hexagonal patterns and fuse together. This is how the old fashioned treat rock candy was made. Growing sugar crystals is fast, fun and easy. You’ll enjoy sharing this project with your children. 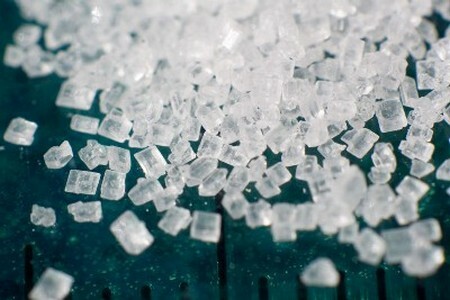 You will be able to observe the growth of the sugar molecules quickly, as soon as after the first 24 hours. And when you’re done, you can eat your work! You can dye eat sugar chain with a different color to give it a pretty effect. Here’s how. Prepare your jar for the experiment. Wash your glass jar with warm water and soap. Anything other substance can negatively effect the results of this experiment. Rinse the jar and dry thoroughly. Attach the cotton string to the center of a butter knife. Place the cotton string in the center of the jar. Allow the butter knife to rest across the opening of the jar. You’ll need to adjust the length of the string. You don’t want your cotton string to rest on the bottom of the jar. Cut the string little by little into it stops ½ inch from the bottom of the jar. We need boiling water to make the sugar chains. Boil 2 cups of water in a pot or saucepan. Remove the boiling water from the stove. To the boiling water add your granulated sugar. This step takes a little time. Add the sugar one spoonful at a time. Use the wooden spoon to mix the sugar into the water. Make sure each spoonful is completely dissolved before adding another spoonful of granulated sugar. Add sugar until no more sugar can be dissolved in the water. Remove the butter knife with the cotton string attached from the glass jar. Pour in the sugar water solution. Place the butter knife back over the opening of the jar. The cotton string should be immersed in the sugar water. Place your jar where it will not be tampered with. Make observations everyday to see how much sugar has collected on the cotton string. After a week you can eat the rock candy.